WASHINGTON — The University of Texas will spend nearly $6 million a year to comply with a string of recent legal rulings requiring colleges to be more generous to their scholarship athletes. That won’t break the bank, Athletic Director Steve Patterson said Tuesday at a forum on the fast-changing business of college sports. But even rich programs like UT’s will be forced to make tough choices in the future if momentum in the courts continues to push colleges to treat their players like employees or semi-pros, he said. Chris Plonsky, director for women’s sports at Texas, said the school already employs 350 workers to coach and care for the students who play in Austin. The money for all of those jobs, she said, comes from just two sports, football and men’s basketball. “If we begin to [further] remunerate the participants, that’s going to break that model,” Plonsky said. 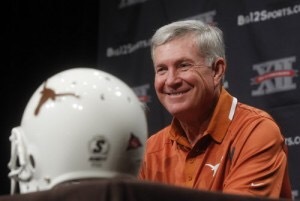 Patterson said UT won’t have problems paying the extra $6 million to its players. That money will break down to about $10,000 for each player. The money will cover college expenses that aren’t covered by a traditional full scholarship and give each player $5,000 in compensation for the university’s use of his image.